A peculiar institution exists in the town of Petersburg, Kentucky. It is a natural history museum of sorts, but no ordinary one. Most natural history museums base their exhibits on the principles of modern science. This one is different. This is the Creation Museum. This strange museum does not promote modern science; it challenges it. It bases its exhibits not on science, but on the tenets of young Earth creationism, the doctrine that the Bible is the revealed word of God and that any understanding of how the world and its inhabitants came to be must begin there. Young Earth creationists reject all latter day theories about the world that are inconsistent with this doctrine. They conclude from literal readings of the Old Testament that the Earth is only about six thousand years old and that God created humans and all other types of living things separately, at about the same time, and in largely their present forms. As such, they reject some of the most fundamental principles of modern science, such as Darwinian evolution and the immense age of the Earth. To most modern people, these are the quaint and long outdated myths of a premodern people living in a pre-scientific era. To young Earth creationists, this is how everything began. 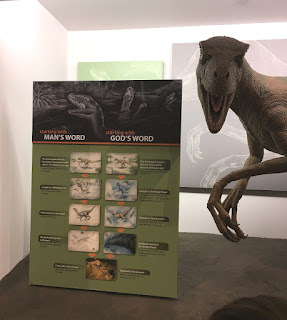 For anyone searching for validation of such beliefs, the Creation Museum is the place to go. Near the town of Williamstown, Kentucky, rising like a mountain from the landscape, is a huge wooden "ship." It is no ordinary ship. Resting upon a concrete platform, it lies far from any ocean and was never intended to touch the water. It is not really a ship, but rather the centerpiece of a bizarre theme park called "The Ark Encounter." There, young Earth creationists will find another of their core beliefs brought to life—the story of Noah's flood. According to the Old Testament, disgusted by the depravities of man, God destroyed most of the world that He had originally created with a globally inundating flood. Young Earth creationist scholars date the flood from biblical chronologies as having occurred around 2348 BCE. In this cataclysm, God spared but one righteous family and a representative two of every living animal and plant with the mission that they repopulate the world anew once the flood waters receded. The Ark Encounter theme park is based on this story. At its center is a full-sized "replica" of Noah's Ark with a museum of sorts inside that provides depictions of what its builders think life inside the Ark must have been like and arguments for the story's historicity. Like its sister institution, the Creation Museum, the Ark Encounter presents a biblical, young Earth view of the world. It endeavors to convince visitors that this ancient story is history, not just myth. The Creation Museum and the recently opened Ark Encounter are the sibling creations of the Kentucky-based Christian apologist organization Answers in Genesis (AiG) and its charismatic president, the Australian-born evangelical and young Earth creationist, Ken Ham. AiG promotes Christian apologetics in a way that I find both intriguing and infuriating. As a one-time geologist, former science teacher, student of Darwinian evolution, and secular activist, I reject the whole notion of creationism. To me, it is an affront to reason. It may be tempting to dismiss young Earth creationists as just a gaggle of uneducated backwoods yokels who cannot bring themselves into the twenty-first century, but that would be a serious mistake. Amazingly, they include elected officials, educators, captains of industry, and many other educated people. In spite of its anachronistic absurdity, creationism is thriving in America in several flavors and is working its way into our educational system and into public policy. Secularists and others who support modern science and the separation of church and state must actively oppose it. To effectively do so, one must understand it. The Creation Museum and Ark Encounter form a "Mecca" of sorts for the young Earth flavor of creationism in America. These are things that I felt I needed to see in order to understand the contemporary creationist movement. So, accompanied by my teenage son Jason, I drove to Kentucky and visited both on a hot Saturday in August of 2016. We started in the morning with the Creation Museum. As we drove into the parking lot, we both felt a little nervous. It was that unease you feel when you enter a place where you think you don't belong. I wondered if there would be a reaction should anyone notice the Darwin Fish emblem on the back of my car. Fortunately, there was none. Pushing our initial trepidations aside, we bought tickets and went on in. The Creation Museum is an interesting place. My first impression was that of a peculiar blend of natural history museum and off-beat theme park. The place has a sort-of Jurassic Park-type feel to it. There was even a smiling employee standing amidst the crowd gently holding a live and quite large lizard. This instantly reminded me of a scene from the movie Jurassic World. We saw a model pterosaur hanging from the ceiling. Going in further, we encountered a mounted mastodon skeleton and animatronic dinosaurs swaying their long necks and tails in tropically foliaged dioramas. 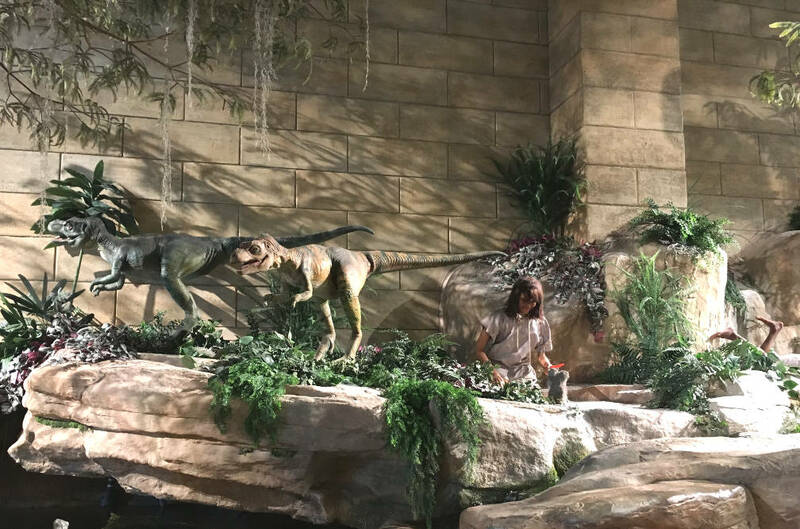 The first clear indication that we were not in a normal natural history museum came when we noticed that one of the dioramas depicts a biblically-attired person sitting next to dinosaurs. This would be the first of several. Like any science-literate person, I know that the last non-avian dinosaurs died out tens of millions of years before the first human appeared. This exhibit should not have startled me given where we were and I was expecting such nonsense, but this scene was just so wrong that it caused me to do a reflexive double-take. The museum was very crowded when we were there and many of the hallways are narrow; so as not to inconsiderately hold up the people behind us, we did not linger long in one place. The museum has a very good fossil collection. It has everything from Paleozoic invertebrates to fishes and dinosaur bones, which are all nicely displayed. Walking by them, I again felt like I was in a normal and well-furnished natural history museum admiring a paleontology exhibit—that was until I stopped to read the accompanying signs. The signs accurately describe what the exhibits are, but go very awry when they give the ages of the fossils. In all cases, they claim that these creatures lived only a few thousands of years ago. They are in fact, far older. Jason and I read the signs, then looked at each other and rolled our eyes. He snickered. I winced in disgust. I looked around to see how other people were reacting. If any of them shared our scorn for the scientific inaccuracies, they did not outwardly show it. I overheard no questioning comments or derisive remarks. From what I could see, nearly everyone else in the crowd was buying into it. I was disappointed by this, but not surprised. Proceeding into a room with an exhibit called "The Fossil Hunt," we saw a diorama of two life-like mannequins of "scientists" excavating a nearly complete dinosaur skeleton. The walls of the room are covered with simulated rock embossed with impressions of fossils. The "fossils" are of a wide variety of creatures, including many that do not belong together, such as trilobites and dinosaur claws. Trilobites and dinosaurs were not around at the same time in Earth's history, so their fossils are never found together in nature. This is not a problem for the Creation Museum, whose curators claim that God created all life at about the same time and then wiped most of it out less than two thousand years later with a great flood. There I learned that most fossils resulted from masses of mud deposited during Noah's flood. Um, right … There are aesthetically appealing signs with statements from supposed "scientists" sporting impressive-sounding credentials who claim that there is solid evidence for a young Earth and a global flood. The exhibit tries to persuade its visitors that "creation science" is a respectable school of scientific thought that has the support of numerous credentialed scientists and that these "scientists" have concluded, from meticulous study of evidence, that the biblical creation story is largely true. I looked at all this and sighed. This is false, but I have no doubt that if one were to look far and wide enough, one could find a few people with scientific credentials who make such claims. They are a tiny minority and are completely outside of the scientific and academic mainstreams, but visitors are not told this. Like every field, the scientific community has a few crackpots loitering in its midst too. I was particularly interested in assessing how effective each exhibit was. By "effective," I mean likely to appeal to someone who is not already a biblical literalist. 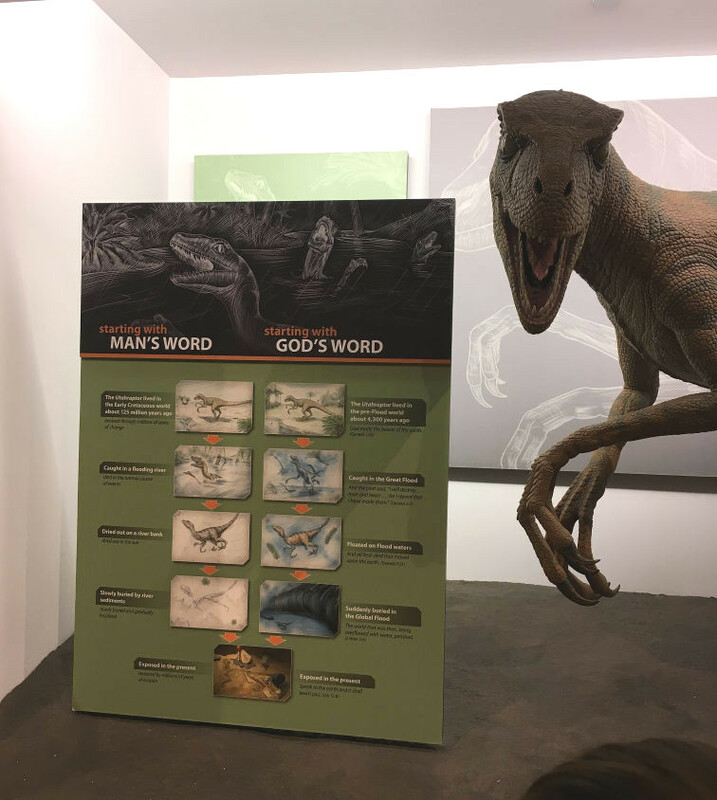 I think that the least effective arguments in the museum are those presented in the many exhibits where they contrast what they call "Man's Word" with "God's Word." In these they spell out what they claim is the secular scientific consensus on some point and then challenge it with excerpts from Scripture. Those arguments will only work with someone who already accepts the Bible literally and therefore needs no further convincing. A non-literalist, even a religious one, is more likely to read them as "Modern Science" vs "Ancient Myth" and will be unimpressed. I think this argument falls flat and I am rather surprised that they use it so much. In my opinion the most effective, but also the most infuriating exhibit in the museum is one that features the famous "Lucy" skeleton. "Lucy" is the nickname given to a partially complete fossil skeleton of the ancestral hominin, Australopithecus afarensis found in Ethiopia in 1974. Lucy’s skull is very ape-like and small-brained, but her body is much more human-like. The overwhelming consensus among specialists is that A. afarensis was a relative of ours that lived between 3 and 4 million years ago. Multiple lines of peer-reviewed evidence indicate that her kind walked upright. Scientists are uncertain if this species was a direct ancestor of ours or an evolutionary cousin, but we are almost certainly descended from one of the australopiths; so in either case, this species represents an intermediate form that connects us with earlier non-human apes. AiG rejects this idea, of course. Their exhibit contains a laid out replica of the Lucy skeleton. It also contains a well-crafted, full reconstruction of what they claim Lucy probably looked like in life. Unsurprisingly, their reconstruction is quite different from ones displayed in other natural history museums. Theirs portrays her hunched over walking on her knuckles like any scruffy old ape and with a body and face resembling those of a small gorilla. Illuminated panels overlay the reconstruction and light up to delineate the pelvic and limb bones inside. The accompanying signage claims that the skeleton is so incomplete that there are various valid ways to interpret it. According to them, mainstream science is presenting just one way and a biased one at that. The exhibit is correct in its claim that most of her face is missing. It offers several different ways that the sparse facial bones could be reconstructed. They favor an interpretation that looks like a gorilla. 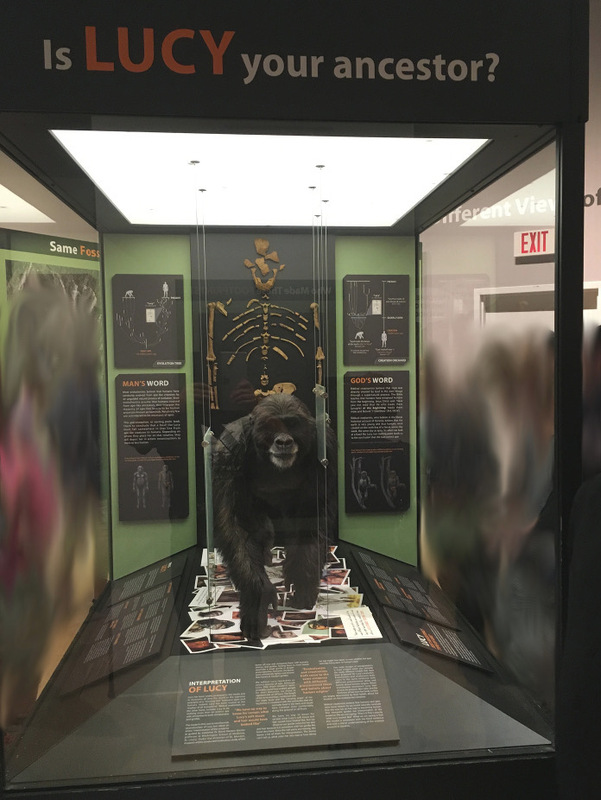 However, the exhibit leaves out the essential fact that although Lucy was the first of her kind to be discovered, she was not the last. Since her discovery, other fossils of her kind with more skull material have been found. With the addition of these, scientists now have a pretty good idea of what her kind looked like and it was not like a gorilla. In its exhibit, AiG concludes that Lucy represents an extinct type of ape that was not related to humans. Their conclusion disregards the rigorous study of these fossils done by real scientists from all over the world over many years. These long and meticulous studies of Lucy and the other A. afarensis fossils have led to the mainstream scientific conclusion that she was an upright-walking human relative and not just some unrelated, knuckle-dragging ape. 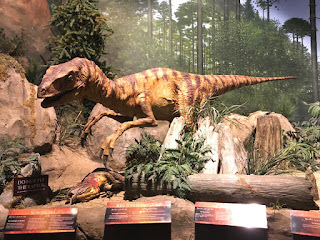 The Creation Museum exhibit is flat out wrong in its insinuation that the mainstream scientific consensus is just someone's subjective interpretation. It is much more than that. Far afield as it is, the reason that I think that the Lucy display is the museum's most effective exhibit is that unlike most of the others, it is not premised primarily on the Bible or divine magic. It has the usual "Man's World" vs "God's Word" sign, but does not rely on that alone to make its case. It presents a faithful replica of the fossil skeleton, a professionally rendered life reconstruction, and some glitzy illuminations of its osteal anatomy. It correctly points out that most of the face is missing and therefore open to interpretation. Superficially, this thesis could seem plausible. 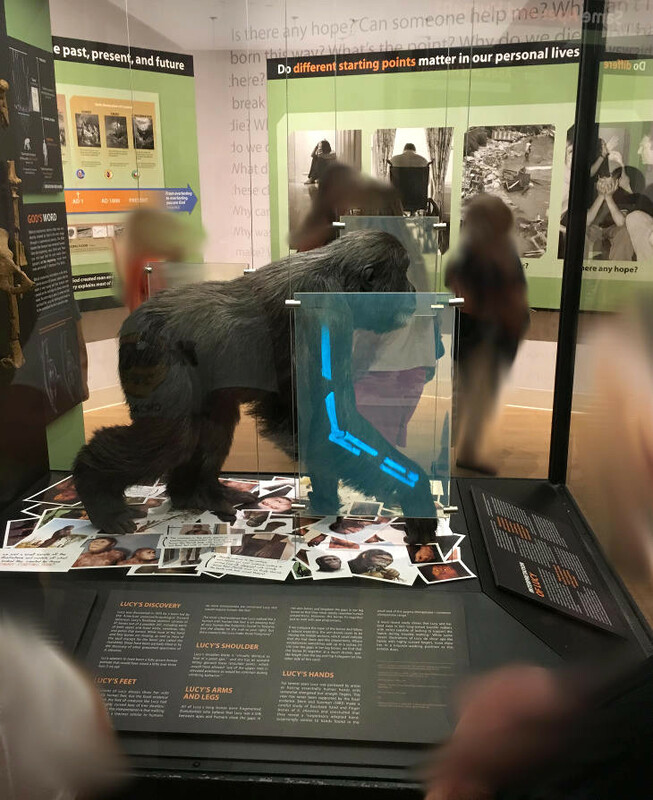 Only a specialist would recognize the display’s subtle, but critical misinterpretations of Lucy's limbs, hip, and joints and the exhibit makes no mention of the other A. afarensis fossils that provide further evidence for a more human-like interpretation. 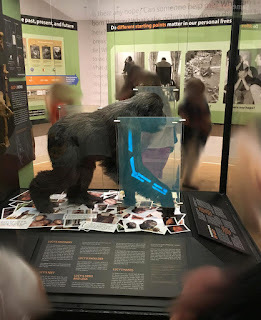 With its polish and seemingly sound reasoning, I can certainly understand how a reasonable and intelligent layperson who does not have much scientific background could view this exhibit and be persuaded that Lucy was just another extinct ape with no connection to us. One of the less flashy, but most important parts of the museum is its "Natural Selection is Not Evolution" exhibit where AiG "explains" Darwinian evolution and natural selection. To my surprise, they at first give essentially accurate short descriptions of both concepts, but then make two serious errors. The first of these is that they artificially constrain the power of natural selection. They accept that natural selection can produce changes, but limit it to producing variations only within a "kind" of organism. According to them, only God can produce fundamentally new types of organisms and He did that only once during his week-long creation spree six thousand years ago. They describe a "kind" of organism as being approximately equivalent to a taxonomic family. As an example, they claim that the different kinds of "dogs" we know today, such as wolves, coyotes, foxes, jackals, and domestic dogs are all the varied descendants of the two ancestral canids that Noah took along on his Ark. They allow that natural selection produced these various kinds of "dog" from an antediluvian base form, but stop there and do not accept that a doggish sort of creature could have derived from an earlier non-dog creature, even over the course of many generations. In other words, a dog may have remote descendants that are markedly different from itself, but they will still be dogs. I suppose that this modest concession to evolutionary change allows them, without undermining their base doctrine, to acknowledge the undeniable reality of natural selection, which has been observed in action with insects, microbes, and other short-lived and rapidly reproducing organisms. This also provides a nifty solution to the obvious problem of fitting two of every kind of creature on a boat, no matter how large. According to AiG, there were only a few thousand base "kinds" of creatures prior to the flood, few enough to fit on the Ark. The millions of species around today are all the product of natural selection acting, within family limits, on their descendants. AiG’s version of biology wrongly severs the essential connection between natural selection and organic evolution at large by greatly underestimating the power of cumulative selection over immense periods of time. The second critical problem with this exhibit is that it ignores the many intermediate forms of creatures found in the fossil record as well as genetic commonalities that connect the distinct "kinds" of creatures found today. The concept of “Deep Time,” which states that the Earth is billions of years old, is fundamental to modern geology and evolutionary biology. It is antithetic to young Earth creationism. For their arguments to stand, AiG must attack this concept head on and they do. Repeated throughout their museum in various ways is a premise that is essential to their whole thesis, that the Earth is only thousands of years old and that the techniques used by secular scientists to date fossils and stratigraphic layers, such as radiometric methods, are not reliable. They make multiple attacks on the integrity of these methods. AiG claims that there is no empirical way of knowing how old these things really are and that they can only be understood within a biblical chronology. They appear to fully understand that if fossils can be definitively shown to be of great and vastly differing ages, their whole 7-days of divine creation thesis collapses. The Creation Museum is well done. Its exhibits are attractive and thoughtfully laid out. It has most of the things that one would expect to find in a mid-sized natural history museum, even a planetarium. The museum tries to be scientific much of the time; however, it is premised on the a priori assertion that the Bible is inherently true. An assertion made without evidence is not science. Many of the museum’s arguments against mainstream scientific principles are based on their inconsistency with the Bible or the presumed young age of the Earth. The fundamental theme of this museum is like a large, intricate house of cards; it is an impressive and thoughtfully erected structure, but if you remove the base card, the whole thing comes crashing down. The presumption of biblical inerrancy is the Creation Museum’s base card. With its Creation Museum, AiG makes a believable show of its fundamentalist casuistry by blending some real science with a heavy dose of nonsense to produce a murky pseudoscientific goulash from which most of the lay public cannot tell where one ends and the other begins. It supports its anti-intellectual concoction with an impressive collection of genuine fossils and other specimens of nature. These it elegantly displays to the visitor tainted with small, but essential misinterpretations. Visitors who already accept the Bible literally will likely leave the place confident that science confirms their religious beliefs. Those who are religious, but unsure about creationism will be intrigued, perhaps persuaded. Visitors who do not accept biblical literalism and who have some scientific literacy will dismiss the whole museum as a bastion of nonsense. A core mission of the Creation Museum is to convince the public that “creation science” is real science. I have no doubt that with many of its visitors, it succeeds in this. After about three hours in the Creation Museum, Jason and I decided that we had had enough of the place. As we walked back to our car, our brains felt rotted. In my mind, I was processing a dizzying melange of feelings ranging from bemusement to bewilderment to disgust. I must admit that I was also impressed with how professional looking the place is. It was time to head off to our next stop. It took us about 40 minutes to drive from the Creation Museum to the Ark Encounter. Upon arrival, one has to park in a large lot that is some distance away from the central attraction. There one pays a fee to board a shuttle bus into the park. AiG’s Ark is enormous. It dominates the local landscape. They claim that it is the largest timber-framed structure in the world and I can believe it. Jason and I walked over to it. We walked around it and under it, just taking it in. We then got in line to go "aboard." 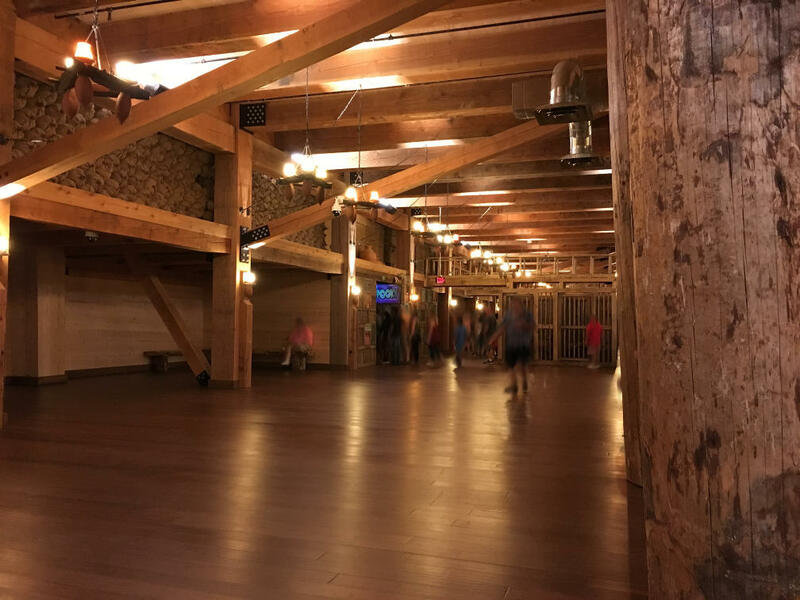 I had heard that on opening day the month before, attendance at the Ark Encounter had been sparse. This was certainly not the case when we were there. The park was packed. We had to stand in a zig-zagging line beneath the structure for more than half an hour before we got in. Upon entering its hull, we were again struck by its size. Inside its cavernous interior are thousands of wooden cages of varying sizes, many with models of animals peering out of them. Moving further in, one encounters dioramas depicting scenes from the biblical story along the hull. The inside is climate controlled and offered us a welcome sanctuary from the sultry summer heat outside. It is interesting, aesthetically attractive, and redolent of freshly cut wood. I thought to myself that this would be a great place to hold a wine tasting or a craft show. It just has that look about it. 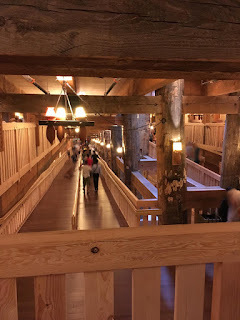 The Ark Encounter is basically a huge, three-dimensional, interactive story book that retells the Old Testament fable of the Great Flood and Noah's Ark. And honestly, the thing is pretty cool. This is by far the most serious and sophisticated rendering of the story that I have ever seen. Most depictions of this story are cartoonish and simply ignore its plenitude of logical problems, such as how Noah could possibly fit two of the millions of species of animals that exist on any vessel—even one this big. A modern aircraft carrier would not hold them all. They simply do not explain how he could have fed them and disposed of their waste or how he could have kept the carnivores from consuming the other animals. The practical problems with this story go on and on. AiG attempts to explain away the most obvious of these. As I mentioned earlier, they claim that all existing animals are descendant of a few thousand base kinds that Noah was able to fit on his Ark. They even borrow the idea of natural selection from modern biology as the mechanism that produced the postdiluvian diversity that we see today. 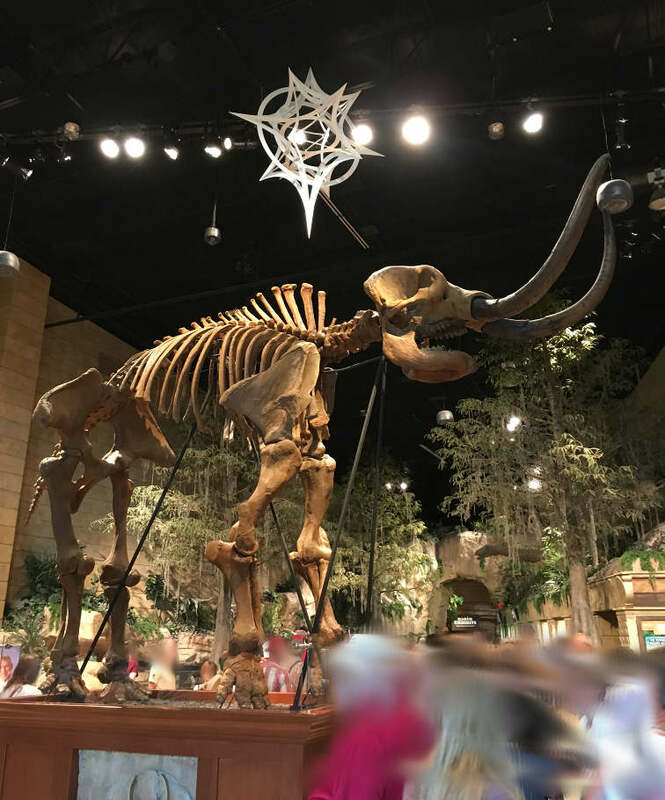 However, like those in the Creation Museum, the Ark exhibits adhere to their claim that natural selection can only produce variations within a base kind of animal created by God. They cherry-pick those bits of modern science that they can shoehorn into their narrative and disregard the inconvenient rest. How did Noah prevent the carnivores from eating the other animals? God made them vegetarians while on the Ark. What about the really big animals, like elephants? How did Noah fit them in? Easy, God only sent the smaller individuals among them, such as juveniles, to the Ark. 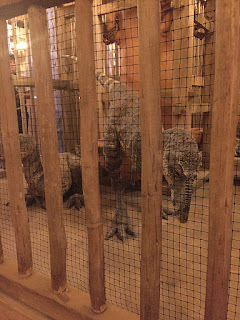 Did you know that there were dinosaurs on Noah's Ark? AiG cheerfully acknowledges the irrefutable evidence for the past existence of dinosaurs and the Bible says that two of every kind of animal were taken aboard. Since the Bible is always right and dinosaurs clearly once existed, there must have been dinosaurs on Noah's Ark. 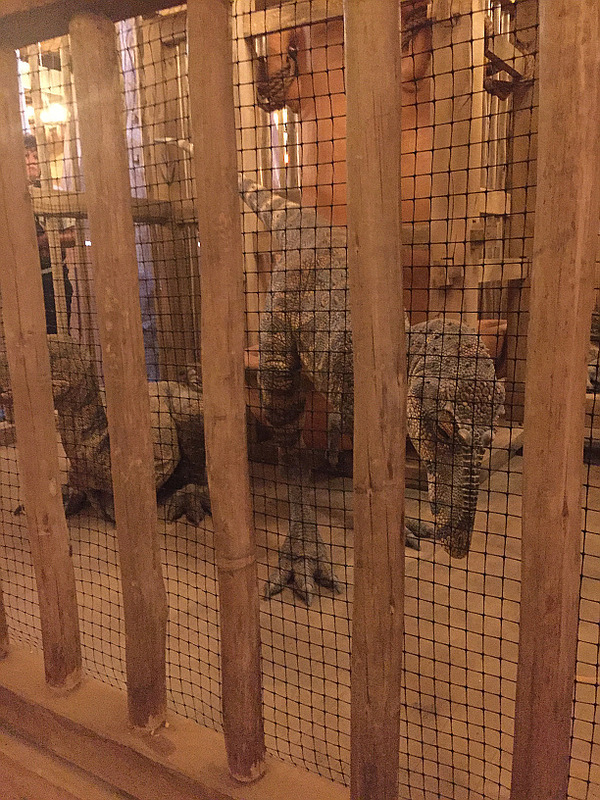 AiG's Ark has cages with dinosaurs in them. Did Noah somehow fit gigantic sauropods onto the Ark too? Remember, all animals are descended from just a few base kinds. AiG estimates that only about fifty or so kinds of dinosaurs would have been needed to later produce their known diversity and they were smaller back then. Sure, their ancestors would have fit on the Ark. AiG acknowledges that dinosaurs and many other types of animals are now extinct, but their forebears must have all been there on the Ark with Noah. They went extinct later and only within the past few thousand years. Do you find it curious that there is no mention of these spectacularly large and hence rather conspicuous animals in the Bible or in any other ancient source? AiG has an answer for that too. Postdiluvian dinosaurs may have been the source of later legends about dragons and other giant monsters. 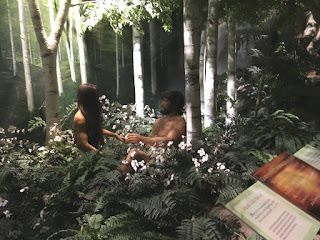 My son and I left the Ark after a few hours with much the same feelings we had after leaving the Creation Museum—a mix of admiration for its scale and sophistication and disconcertion with its absurdity. As spectacular as AiG's Ark is, I think it less effective than the Creation Museum. I cannot imagine that anyone other than an adamant religious fundamentalist would accept its story unquestioningly. The logical problems with the story of Noah's Ark are so intractable that even a person of deep faith, but who holds onto at least a thread of rationalism, would have trouble accepting it literally. Still, AiG has done a better job than anyone before in bringing this fable to form. I must credit them for creativity in their attempts to address the story's many failings, but even their most thoughtful explanations inevitably fall short. The Creation Museum and the Ark Encounter are impressive. Never before have I seen modern science attacked so professionally and with such panache and flair. No where else have I seen pseudoscience and logical absurdities packaged and persuasively delivered with such glittering polish and on such a colossal scale. What AiG does, it does well. In spite of my disgust with their deep scientific and historical flaws, I rather enjoyed both attractions in a perverse sort of way and I must grudgingly acknowledge a measure of admiration for Ken Ham. I almost want to meet him. This is similar to the way I felt a few years ago after visiting the Thomas Road megachurch and Liberty University in Lynchburg, Virginia. Both are the mammoth creations of the late Rev. Jerry Falwell, Sr. and his "Moral Majority." I was awed by the sizes of those institutions. It is remarkable what one truly dedicated and talented person starting with almost nothing was able to achieve in one life-time. Even though I detest everything that Falwell stood for, I could not help but admire the man for his energy and organizational skills. This is how I feel about Ken Ham also. He is clearly a tremendously talented man who possesses profound organizational skills, but like Falwell before him, I wish that he would be apply his abilities to better purpose.